Every organization has a unique culture and any act to bring about a sustainable change needs to be sensitive to the existing culture. Gandhi, in 1915, either didn’t understand this yet or he hadn’t fully internalized it. Gandhi had a four day visit to Shantiniketan in February 1915 a month after his arrival in India. During this visit he conducted a self-help experiment with all the students and teachers. Like his visit, the impact of the experiment was short-lived. What was the experiment? And why did it fail? Let’s explore it here. In 1904, Gandhi had established an Ashram in South Africa in a town called Phoenix about 14 miles from Durban. In 1915, when Gandhi returned to India many of his Phoenix Farm associates followed him as well. It so happened that the Phoenix party arrived before Gandhi arrived and found a home in Shantiniketan. After visiting Gokhale in Pune and meeting relatives in Rajkot and Porbandar, Gandhi proceeded to Shantiniketan. The phoenix family had been assigned a separate quarters at Shantiniketan. Maganlal Gandhi, Gandhi’s close associate in Phoenix Farm, was their head, and he had made it his business to see that all the rules of the Phoenix Ashram should be scrupulously observed. Among Gandhi’s friends Andrews and Pearson were also present. 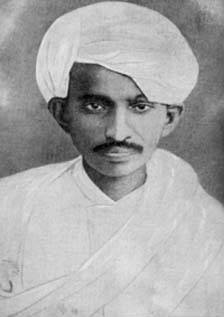 Soon after his arrival Gandhi mixed with the teachers and students and engaged them in a discussion on self-help. He suggested to the teachers that, if they and the boys dispensed with the services of paid cooks and cooked their food themselves, it would enable the teachers to control the kitchen from the point of view of the boys’ physical and moral health. Also it would give lessons on self-help to the students. Some nodded their head tentatively, some appeared more enthusiastic. Gandhi invited Rabindranath to give his opinion. He said he didn’t mind it provided the teachers were favorable. To the boys, he said, “The experiment contains the key to Swaraj”. Thus started an experiment involving the entire community of 125 boys and their teachers. Boys were running the kitchen, handling the garbage, cleaning the latrine, sweeping the ground and as Gandhi’s biographer Louis Fischer puts it, “forsaking the muse for the monk”. Pearson was looking after the cooking part and Nagenbabu was looking after the sanitary cleaning. It was difficult for the students. Some began to show early fatigue. Cleaning of vessels was especially tedious. A group of students played sitar next to the kitchen so as to make the task feel less cumbersome. Gandhi and Tagore were united by their love for India and mankind. However, they were very different personalities. In the words of Louis Fischer, “Gandhi was the wheat field and Tagore the rose garden, Gandhi was the working arm and Tagore the singing voice, Gandhi was frugal and Tagore was prodigal”. At Shantiniketan, Tagore’s pupils sang and danced, wove garlands, painted sunrise and made life sweet and beautiful. Gandhi’s experiment essentially turned the place upside down. It is no surprise, it was shortlived. I feel it is a great lesson to understand what culture-unfriendly intervention is like. Adding a comment from my friend Ravindra Keskar who is Professor of Computer Computer Science at VIT Nagpur. Interesting read your blog article was. Incidentally at the same time, I came across a couple of articles in Lokprabha those discussed about different paradigms in education being tried out (with or without school). One of those described Gandhi's philosophy towards education which gandhi had formalised as "Nayi Taalim". And the most important aspect of "Nayi Taalim" was work-based education, thus enabling students to become self-dependent and directly productive to the society (finally culminating into self-sufficient villages). And indeed, a few schools started that time incorporated this culture of "nayi Taalim".Thus, it seems the basic philosophy of Gandhi was "work-based education", whereas for Tagore it was "creativity-based education". And it looks these views were orthogonal and hence clashed. But one thought that I had, after thinking so much. Are these two views (of Tagore and Gandhi) are really mutually exclusive and could not have been merged at all? Or was it the way that Gandhi used to introduce his views to Tagore's school that failed? So, was the problem with philosophy itself or the method of intervention? (I think, it was both). For example, if Tagore was asked to introduce his world-view to Gandhi's students, would it have also failed in the similar manner? Or, would Tagore with his more sensitivity towards young minds would have been more successful than Gandhi? I don't know. What do you think? Here are 2 articles in Lokprabha that I mentioned earlier, which are worth reading at-least once for the new thoughts/experiments presented (even if I don't agree with everything there). education (this one is initially routine, but please do read till the end). I feel that the two approaches are not mutually exclusive. However, given the strong biases of the leaders (Tagore and Gandhi) it is very difficult to mix them seamlessly. Unless the leaders themselves change. However, the method of intervention Gandhi used could be improved. One thing is to start with bright spots, those boys or teachers who are exhibiting self-help perhaps occasionally. And then ask – why is it working in these cases and not in others? Bright spot analysis usually leads to some insights which are replicable in more places in the institute. Note that bright spot analysis as an intervention is culture-friendly. Another way to do is to conduct one or two day camp outside the premises where students and teachers perform all the tasks (cooking, cleaning etc). This gives an experience of self-help and still doesn’t try to change the existing processes. “The burning man” annual event in Nevada desert is a classic social experiment to give experience of “moneyless living”. You don’t abandon using money after the event, but certainly gain a unique perspective about role of money in life. I liked your 1-2 day camp idea. This will help to expose participants to a different way of life which is not thrust upon them in their routine lives. Regularity of such events will help participants to imbibe the practices in their daily life, even if on a smaller scale. As you said, there will be a few bright spots (maybe these students' basic constitution was more receptive to this new way of life). Another important comment you make is "Leaders should themselves change". Unless they show acceptance of other view point, people will not cross over. In Gandhi's experiment, he should have first accepted, respected and imbibed at-least-a-little of what Tagore's viewpoint was. This would have made students and teachers accept Gandhi as one of their own (and not as an alien) and they would have been more receptive to what he was telling. Similarly, what were Gandhi's views on Tagore's way of looking at life? Looks like, Gandhi didn't imbibe Tagore's way at all whereas Tagore was skeptical and indifferent. Not a good environment for the success of intervention, right? Thanks for continuing the dialog and asking critical questions. Both Gandhi and Tagore had respect for each others' ideas in spite of the differences. Tagore is said to have visited Sabarmati in Jan 1930 to understand Gandhi's plan of action. This was a month before Gandhi announced Salt march. In this specific case, I agree with you that Gandhi didn't spend enough time at Shantiniketan to start such a strong intervention. It is interesting that you mentioned "what will clients say to their people when you start your intervention". My experience now tells me that if the intervention in which I participate is looked as "my intervention" (i.e. external consultant's intervention) chances of it succeeding are less. It can at best be co-owned by the consultant but ideally owned by the client. Hence, the failure of intervention at Shantiniketan may be that it was never owned by Tagore in the first place.